Over a year ago, Karolyne White was living in a hotel because her house had flooded. Her daughter and son-in-law gave her a two-inch tomato plant for Mother’s Day to help bring a little garden to the room. She watered it, she put it outside to get some sunlight and it started to grow, and then grow, and grow some more. It outgrew its stakes and by the time Karolyne moved out of the hotel six months later, it had already bloomed and yielded fruit. Fall had arrived and Karolyne left the plant behind when she moved. But the story of the plant doesn’t end here. One of the hotel workers knew Karolyne could be reached at Grace Congregational UCC in Framingham, so he delivered the plant to the church office. Karolyne put the plant by the window, and continued to water it. Because it kept bearing those red fruits, Karolyne thought of the plant as a symbol that God is Still Speaking. By November, Pastor Brad Watters thought it was time to get rid of the plant -- which was now becoming unwieldy and taking over too much of the office space -- and add it to the compost pile. (Grace Church happens to be a Green Congregation.) Karolyne refused because it was still thriving and reminding her that God is Still Speaking. In December, Brad broke off a 3-inch twig and attached it to his ailing poinsettia plant. 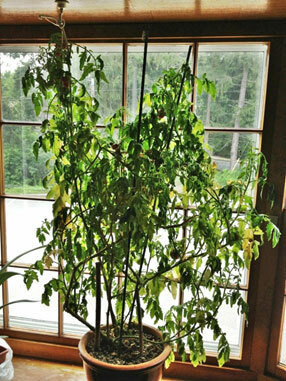 Within weeks, the twig grew to 12 inches, and one could see tomatoes peeking through the now healthy poinsettia leaves. Even when the fruits were hiding among different plant leaves, Karolyn was reminded that God is Still Speaking. Winter came and went and it still continued to grow and produce fruit. Despite cold and seasonal darkness, God is Still Speaking. Some members doubted the plant was the original because they didn’t believe it could stay alive throughout winter. Then spring arrived and it continued to flourish. Despite the doubting, God is Still Speaking. Now it is summer. The original plant is still growing and still producing fruit. And God is Still Speaking.